Anthropology: What kind of job will you get with that? New Zealand's concern over an 'obesity epidemic' has resulted in overweight bodies being linked to a biomedical model of disease. This post discusses some of the issues from Tayla's Honours thesis in which she argued that cultural and social forces of morality and medical discourses shape how New Zealand society perceive overweight individuals. Not long ago, I overheard a five year old call a woman fat. She didn't mean it as an insult; it was simply her way of describing the appearance of someone. “No, not that lady, the fat one” she said. And that isn't her fault - no five year old is aware of the consequences of calling someone fat, nowadays it’s just so perfectly normal to categorize people based on their weight, and because it’s so normal to categorize people based on size, it has also become so perfectly acceptable to discriminate against overweight people. 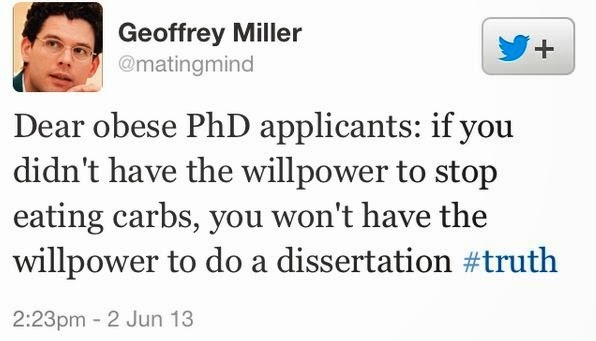 There are a number of reasons why this is the case, in fact it took me a whole year of research and a 10,000 word dissertation to discuss only a mere few reasons why discrimination against fat people is so common in Western society. What I have come to realise, however, is that discrimination against overweight people is so normalised because it’s so embedded in public health promotion. And one of the ways in which this public health promotion reaches the general public, and what this post discusses, is through the use of the media. American Evolutionary Psychologist Geoffery Miller's scandalous tweet exemplifies how individuals think it is acceptable to discriminate against size. News media, and mass-produced popular media such as television, advertising and visual imagery act as one medium in which we view overweight individuals. Lupton (1995) argues that for many lay people, the media constitutes one of the most important sources of information about health and medicine. Searching for the word ‘obesity’ on New Zealand’s number one news website, Stuff.co.nz, results in 4,930 hits (Accessed March 21 2014). Article titles read ‘Obesity to overtake smoking in health states’, ‘Startling rise in levels of obesity’, ‘Obesity surgeries on the rise’, ‘Obesity danger in New Zealand’ and so forth. 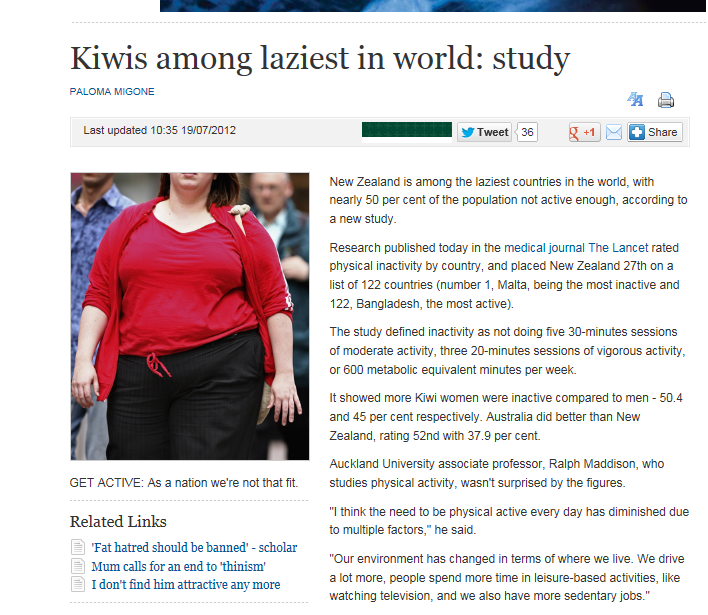 These articles contain statistics and numbers to legitimise their claims about obesity, entailing ‘truth’ discourses about the vital characteristics of living human beings within New Zealand. For example, an article titled ‘Obesity at record high’ states “The New Zealand Health Survey released by the Ministry of Health shows 5.6 percent of the female population is tipping the body size scales into the “very severe risk” category”. The argument is backed up with statistics to claim “the “very severe risk” associated with morbid obesity includes the onset of type 2 diabetes, heart disease, hypertension, stroke and some cancers” by claiming “one third of the district’s [Counties Manukau] adult population is obese – well over the national total of 26.5 percent” (Stuff 2008). Additionally, another article posted on the same website titled ‘Govt criticised for lack of action on obesity’ uses the same statistical strategy by claiming “A health committee inquiry into obesity and type-2 diabetes in 2007 said the obesity epidemic threatened to overwhelm the health system without a concerted government-led response” (Todd 2010). These reports, numbers and statistics become engrained knowledge in our minds because statistics serve to amplify and legitimate the knowledge about body weight that the public receives. Among the general public, these numbers, studies and reports speak in the name of ‘truth’ and very few challenge their authority (Pollard 2008:32). Additionally, news media articles thrive on using melodramatic terms such as ‘epidemic’, ‘time bomb’ and ‘war on fat’. Furthermore ‘shock headlines’ such as ‘Shocking rates of obesity among kids’ (Stuff 2014) and ‘Obesity: A crisis of the elderly’ (Stuff 2013) work alongside photos and graphs which amplify the seriousness of a ‘public health concern’ with being overweight that is easily accessible and readable by the general public. Such tools in news media represents the idea of ‘moral panic’ - a tool regularly used by journalists to guarantee the kind of emotional involvement that keeps up the interest of tabloid and newspaper readers (McRobbie et al. 1995:559-60). Moral panics serve to reassert the dominance of an established value system at a time of perceived anxiety and crisis (Jenkins 1992:7). Consequently, public health disasters such as the ‘obesity epidemic’ that are portrayed in the news media become our frame of communication of information and health. Another common example of moral panic is through the use of visual imagery. Think about every news article you have read or viewed which discuss studies and concerns about obesity - these stories are often, if not always, accompanied by an image of a ‘headless fatty’, a term coined by fat studies researcher Charlotte Cooper (2007). Seemingly photographed unawares, the fat person in the media is portrayed as a symbol, a collective problem, with their head neatly cropped out of the picture. As headless fatties, Cooper argues, the body becomes symbolic of the ‘obesity epidemic’. There they are, but they have “no voice, no mouth, head, brain, thoughts or comments; instead they are reduced and dehumanised as symbols of cultural fear of the body, the belly, the arse, the food”. It is argued that the growing scientific and medical authority behind the talk of obesity has given way to, and encourages public ridicule and discrimination against those living with overweight bodies (Gard et al. 2005; Greenhalgh 2012; McPhail 2009). This process develops a Foucauldian perspective, in which ‘fat talk’ is a “complex, internally structured, historically specific body of knowledge” which structures how weight and weight-related behaviour can be talked about and how this produces effects (Greenhalgh 2012:473). Greenhalgh suggests there are two types of fat talk. The first is bio-pedagogical fat talk, where the discourse on weight serves to inform people of their weight status and instructs them on what practices they must adopt to achieve a normative body weight. “Fat people are so off putting. Some times if I’m feeling down I stand outside a KFC an (sic) just watch a group of fatties woffle down a 20 piece pack. Just watching them wipe the grease off their double chin brightens my day”. “Obesity is not a disease, it is a self inflicted injury. Instead of just looking at the bottle of coke that the fatties are buying, take a look at the pies and chips that they have bought at the same time”. “Fat people disgust me… go for a run and have a salad instead of watching tv and eating KFC otherwise stay fat and dont (sic) complain about it”. These fat-abuse comments are a means of the public acting on behalf of the dominant social order, a means of actively intervening in the space of public opinion through the use of highly emotive, destructive language, with the purpose of requiring something be done about it (McRobbie 1995:562). As Jenkins (1992) points out, this approach has made it possible to consider the role of the media and the accessibility it provides for individuals to promote and express fat-abuse viewpoints. 1. A ‘fat subject’ is born when an above-average weight young person is subjected to an increase of derogatory ‘fat talk’ telling her that her weight is excessive and that weight is the identity most crucial to social acceptance. 2. Her growing self-consciousness and shame about her weight gradually develops into a weight obsession, as efforts to lose weight fails. 3. As weight struggles come to dominate her life, she gradually takes on the identity of the fat subject and the constellation of emotions, social behaviours and bodily practices that go along with it (2012: 474). I must note that much of media discourse (such as news media) becomes a site on which various social groups, institutions and ideologies struggle over definition and construction of social reality (Gurevitch et al. 1985). What I mean, is though much of people's attention is influenced by media cues about what is important, individuals evaluate news in light of past learning and determine how well it squares with their own reality. So while I argue that news media in New Zealand and the accompanying statistics, photographs and comments play a vital role in constructing the way in which we view overweight bodies, not all individuals are so influenced. These examples present one way of examining how and why it is so common that we discriminate against individuals for their weight in New Zealand and how this is linked to a public health concern over the ever-threatening 'obesity epidemic'. 2007 Headless fatties. July 1. http://charlottecooper.net/publishing/digital/headless-fatties-01-07/, Accessed 10 August 2013. 2005 The obesity epidemic: science, morality and ideology. Abingdon, UK: Routledge. 2012 Weighty Subjects: The biopolitics of the U.S war on fat. American Ethnologist 39(3):471-487. Gurevitch, M. and M. R. Levy, M. R.
1985 Mass Communication Review Yearbook 5 . California: Sage. 1992 Intimate enemies: Moral panics in contemporary Great Britain. Transaction Books. 1995 The Imperative of Health: Public health and the regulated body. London: Sage Publications. 2009 What to do with the “Tubby Hubby?” “Obesity”, the crisis of masculinity and the nuclear family in early Cold War Canada. Antipode 41(5):1021-1050. 1995 Rethinking 'moral panic' for multi-mediated social worlds. British journal of sociology 46(4):559-574. 2008 Western Diseases: An Evolutionary Perspective. Cambridge University Press. 2013 Coke joins obesity fight. July 23 20:37 NZST http://www.stuff.co.nz/life-style/food-wine/8955024/Coke-joins-obesity-fight, Accessed 12 August 2013. All written content and images copyright of anthsisters.com 2014 unless otherwise stated . Simple theme. Powered by Blogger.